SYHS-5 Three Dimensions Mixer is used for mixing powder and granular materials in the pharmaceutical, chemical, foodstuff, light-industry, electronics, machinery, metallurgical, nation defense industries and other R&D institutions. 1.The mixing barrel of the machine moves in multi-directions. The mixing rate is high. It is one of the ideal mixing machines at present. 2.The material-loading rate of the mixing barrel is high, up to 90% (compared with only 50% of the normal mixers). It has high efficiency and short mixing time. 3.The mixing barrel adopts circular arc transition and it is well polished. The machine is used for mixing powder and granular materials in the pharmaceutical, chemical, foodstuff, light-industry, electronics, machinery, metallurgical, nation defense industries and other R&D institutions. 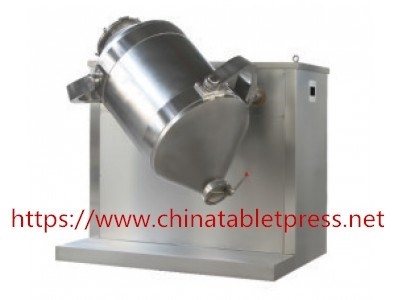 Three dimensions mixer is used for mixing powder and granular materials in the pharmaceutical, chemical, foodstuff, light-industry, electronics, machinery, metallurgical, nation defense industries and other R＆D institutions.